In a previous post I talked about the importance of using web signposts in web design and this article continues on with three quick examples of websites that Rake Mark has signposts utilised them for their clients. In the real world, a signpost is a road sign that’s used to point you in the right direction. It’s a big obvious sign that usually has a destination or place name and an arrow. The web equivalent of ‘a big obvious sign with a destination and an arrow’ is an obvious visual clue to a destination on your website and then a hyperlink, instead of an arrow, that takes the user to that destination. A powerful use of signposts is when you are ranking in Google for a generic or local search term, like ‘web design Staffordshire’. When a visitor arrives at your website using this generic term, signposts on the landing page can be used to direct them quickly to the area of the site that interests them. So although they landed using the term web design Staffordshire, they can quickly find their way to the affordable web design section. You can find out more about website signposts in the earlier article, however, here is three real world examples to show how they are easy to use and simple to implement. The e-Quip website for Integra supports two main products, e-Quip AM and e-Quip PM. Most visitors will arrive at their site looking for support for one of these two products. To help visitors register that they are in the right place and identify which route they want to take we used two quite large signposts that went the full width of the page at about the fold. These take the visitor quickly to the part of website that the need to get to. The Embodied Living website uses signposts to give visual clues to their main menu. This is particularly effective as the top menu is quite complex to a layman and the visual side menu really helps the casual visitor find the information that is pertinent to them. This works really well if the visitor has arrived using a generic search term. A signpost can support both of these approaches. The call to action on the problem bathing website sits nicely between these two extremes with bold looking signpost that just lets the user know what they should do next. The longer they dwell on the site the more this type of signpost embeds into their subconscious. 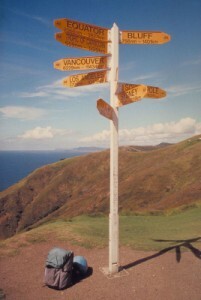 A signpost in the real world is a big obvious sign that usually has a destination and an arrow. On your website a signpost should contain an obvious visual clue, like an image, that takes a segmented group of users to a destination on your website via a hyperlink. Also this can be used in tandem with your search keywords. If you were ranking for ‘web design in Stafford’ then your landing page, especially if it is your home page, is unlikely to scream ‘Web Design Staffordshire’ and signposts can then be used to direct those landing visitors to the area they want to go. In our three examples we looked at using a signpost for quick home page direction and also to support the main menu. 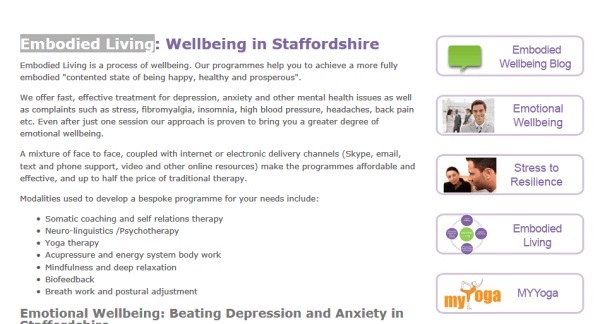 The example for Embodied Living and the main Rake Mark website both support the main menu and also help visitors who have arrived from generic keywords like ‘web design Staffordshire’ establish they are in the right place and also direct them to the information they need quickly. The effectiveness of a call to action can be increased many times by using a web site signpost within your web design. They are so easy to implement that you really should look at ways to include them in your web design: Staffordshire Web Designer Phil Brassington brings weekly web design articles via the Rake Mark Blog and is a director of Rake Mark Web Design, Staffordshire. I entirely appreciate this blog… Please post more…. Thank you very much for that splendid article. I am so impressed I had to save it so I continously go back and read things I may have skimmed. naturally like your web-site I will certainly come again again..
attention-grabbing, You’re a skilled blogger. I have joined your rss feed and I’ve shared your web site in my social networks.